The adventures to be had in the Bay of Islands certainly don’t end above ground. Beneath the surface of our turquoise waters lies a subtropical haven of hidden secrets. 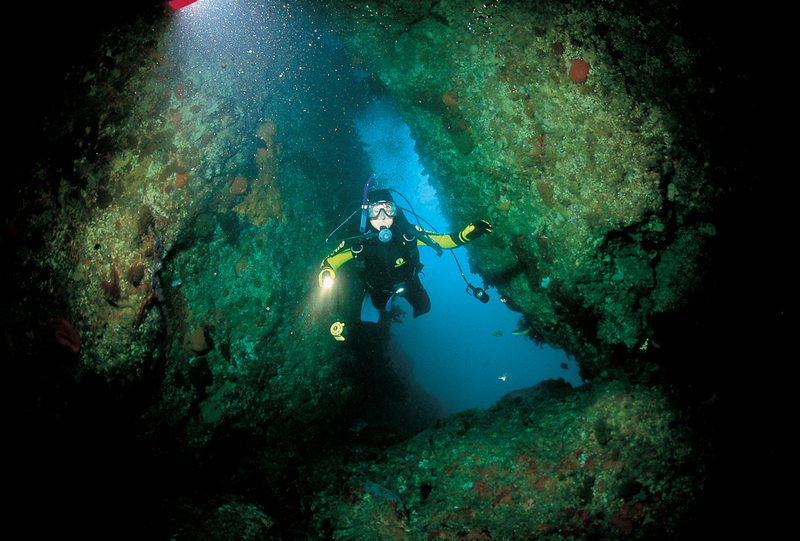 Whether it’s exotic aquatic life, dramatic volcanic terrain or rich New Zealand History that most floats your boat, scuba diving in our unique corner of the world promises the experience of a lifetime. 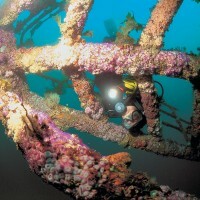 The Rainbow Warrior has become a home to reef fishes and is well-known world-wide as a spectacular scuba diving location. There is no other place on Earth where you can find the same magically diverse combination of local and tropical marine life that the Bay of Islands boasts. Our warm ocean currents, which wash to our shores right down from the equator, bring with them such an impressive array of vibrant tropical fish species that you could be forgiven for forgetting you are diving in the temperate climate of New Zealand. That is until a true Kiwi ocean-dweller stuns you with its awe-inspiring presence, such as our majestic Short-tail Stingray – up to 350kg and 3 metres of it! From Lord Howe Coral fish, Kermadec Scalyfins and Blue Maomao to Seahorses and even the foreign tourists like Manta Rays and Sea Turtles, our spectacular marine animals offer a breathtaking encounter for all when diving here in the “Winterless North”. 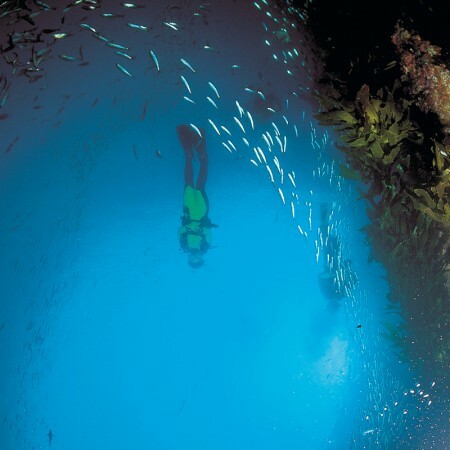 During a reef dive you will also have the chance to explore 1.5m high kelp forests, magnificent underwater rocks and boulders, and some of the most spellbinding caves, caverns and canyons imaginable. Rāhui are in place in a number of the local dive spots, meaning the sea life has been given the chance to flourish and thrive. This leads to the advantageous side effect of preserving a beautiful natural dive experience for those who wish to explore the depths. 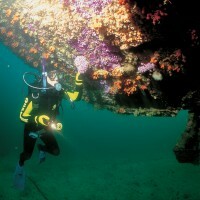 Our natural treasures are only the beginning of the underwater adventure in the Bay of Islands, however. Why stop there when you can enjoy a trip back in history? 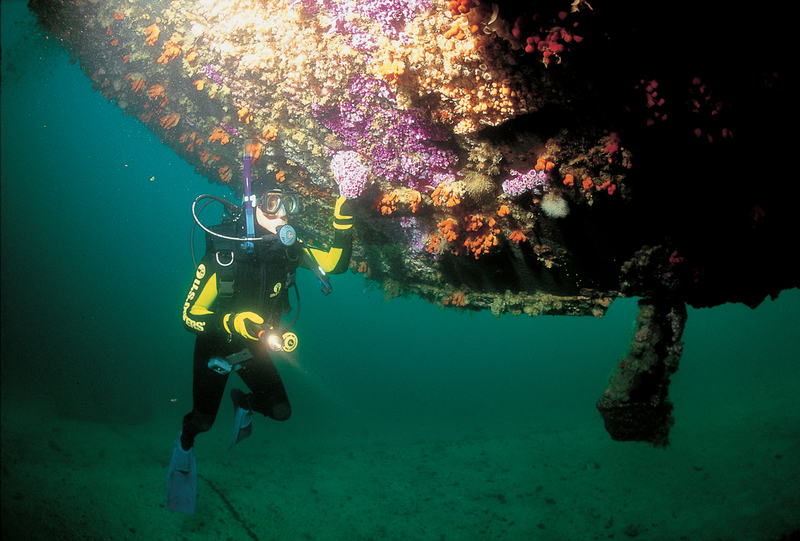 Our subtropical waters are home to not one, but two of the finest intact shipwrecks on New Zealand’s ocean floor, attracting diving enthusiasts from all around the world. On 10th July 1985, the flagship of the Greenpeace fleet – the Rainbow Warrior – was sunk by two bombs in the Port of Auckland as it was en route to protest against a French nuclear test in Moruroa. One man – a photographer – was killed in the attack, and it was later revealed that two agents working for the French foreign intelligence service were responsible for the sinking, in what was codenamed Opération Satanique. After being deemed irreparable, she was finally scuttled in Matauri Bay near the Cavalli Islands in 1987, and has since served as a fish sanctuary and dive wreck for tourists in the Bay of Islands. 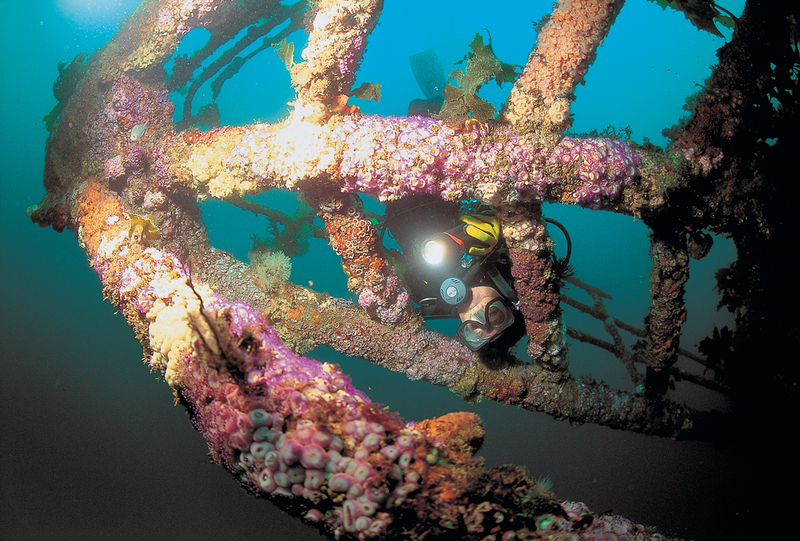 If dive wrecks are your thing, you will also be entranced by our second piece of underwater history, the HMNZS Canterbury, which was laid to rest in Deep Water Cove in 2007 after being decommissioned two years earlier. The iconic Navy Frigate, which sailed around 960,000 nautical miles in service to Her Majesty between 1971 and 2005, is now home to an abundance of fish life, as well as the beautiful array of soft corals and kelp outcrops which are gradually enveloping the striking hull year after year. 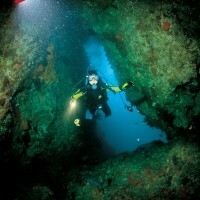 Whether you are a novice, recreational or advanced diver, there is something in the Bay of Islands for everyone. With a range of highly reputable dive operators in the local area to choose between, you can plan your excursion knowing your safety will be of paramount importance. So don’t wait until tomorrow to book your once-in-a-lifetime dive in the warm, sheltered bays of the Far North. Make your dreams a reality today!